1. The Hall of Fame is reserved for the posthumous recognition of services to aviculture. 2. The Roll of Honour marks the achievements of living aviculturists. 3. Nominations for the Hall of Fame and the Roll of Honour must be made in writing to the NCA Awards Panel, formally proposed and seconded, preferably by officials of a recognised avicultural organisation on their headed notepaper, stating in no more than 150 words the case for an award to be made. For work to widen our understanding of birds and their welfare e.g. academic research / veterinary treatments etc. For educating, informing or entertaining bird keepers and the wider public on any and all aspects of bird keeping. 5. All nominations to be submitted to the Awards Panel who will consider applications and make recommendations to the full NCA Management Committee. 6. Diplomas will be issued by the NCA for presentation by the organisations who submitted the nominations at their A.G.M.s or directly by the NCA on special occasions. 7. The names of all successful nominees to be published on the NCA website and in Cage Birds Magazine. The Long Service Award is for any member of any association affiliated to the NCA who is nominated by his or her club as a bone fide member who has served that club for 15 years (a Bronze Badge), 20 years (a Silver Badge) or 25 years (a Golden Badge). Club Secretaries should apply to the NCA Awards Panel giving the names of members who qualify and which badge they require. The NCA will provide badges free to all its affiliated societies. In welcoming the launch of this new award scheme NCA Chairman, Sean Fitzpatrick, said : "We hope very much that those long-serving members of bird clubs throughout the country who form the backbone of our wonderful hobby and yet who rarely get the chance to celebrate their vital contribution to it, will take up this opportunity to mark their achievement and will wear their badges with pride." Established to commemorate great bird keepers of the past whose contribution to aviculture ought not to be forgotten. Yorkshire Canary Judge and YCC Chairman for many years. Described as the best cage bird photographer of our time, who devised the most welfare friendly method of photographing bird yet created. Dennis took over 15,000 slides of the most common cage birds and their variations, and his library is the most comprehensive available. Credited with producing the modern budgerigar we know today. NCA President recognised for his work for the NCA and the British Bird Council. Leading Yorkshire Canary fancier in 2nd half of the 20th Century. Creator of the modern Yorkshire Canary model. 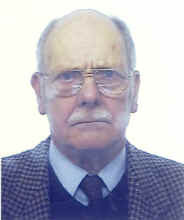 Founder member of NCA, Canary Council, Fife Federation and life-time member of Grantham CBS. Overseer of canary sections at National Exhibition. British Bird Breeder and outstanding Author. All round bird keeper and writer. Stalwart of the Budgerigar Society, and Parrot Society. Former Assistant Editor of Cage & Aviary Birds, and Foreign Bird Breeder. Founding member & former secretary of the Budgerigar Society, a prolific author & Budgerigar and Zebra Finch breeder. Noted Parrot Breeder and Author. One of the first Yorkshire Canary Breeders. For many years a stalwart of the National Exhibition. Well known U.K. expert and writer on Waxbills. For his lifetime of service to aviculture in the Foreign section at national, regional and local levels. For services over the past half century to the Zebra Finch Society and Fancy. Forefront of Zebra Finch and Bengalese Finch Breeding, long-standing Judge for all bird types. Longstanding member of the Avicultural Society who worked tirelessly for the society as well as for the Foreign Bird League as past Editor. Former Cage & Aviary Birds Editor and Budgerigar Breeder. A canary man of vision, innovative and creator of the " Warwick Canary"
Successful Foreign Bird Fancy exhibitor. Member of FBL over 50 years and YFBS over 30 years and many other societies. A well known respected Foreign Bird breeder, exhibitor, judge and administrator. Chairman of the Norfolk FBA and North Walsham AS. LVP and former Chairman of NCA, Canary Council Secretary and Treasurer, CCBA officer. To recognise the outstanding achievements of living bird keepers. Lifetime work for the NCA, Canary Council, Fife Federation and Grantham CBS. President of NCA, Founder member of Canary Council, holder of many positions in the Border Canary fancy. Secretary for Sheppey CBS & Kent Federation of CBSs for many years. Former President of the Canary Council and founder member of the Canary Council and Lizard Canary Association. For services to the Yorkshire Canary Fancy, Chairman of the Canary Council and his work for the National Council for Aviculture. For outstanding contribution to the Budgerigar Society over 31 years. Past President & Chairman of the Budgerigar Society and his work for the National Council for Aviculture and local Cage Bird Societies. For his long service and contribution to the Budgerigar Society over 24 years and past President of the Budgerigar Society and the National Council for Aviculture and in the formation of COM-UK, in promotion of bird keeping and exhibiting in the U.K.
For his long service and contribution to the Canary Council, The Fife Fancy Federation as secretary for 20 years and the National Council for Aviculture and in the formation of COM-UK in the promotion of birdkeeping and exhibiting in the UK. Long established and well respected Zebra Finch and Bengalese fancier and judge. Past chairman and president of the Zebra Finch Society, current acting secretary and treasurer of the National Bengalese Fanciers Association and also past chairman and president of the NCA. Long established and well respected Border Canary fancier and judge over many years. His long time in the hobby over 80 years made him one the most well known and respected fanciers from Wales. Worked tirelessly for the Border fancy and founder member of the West Wales Border FCC. Prolific author and authority on parrots and parrot-like birds. Tireless campaigner and conservationist for parrot species throughout the world. Long established and well respected Canary breeder and international judge in the Old Variety Canaries who promoted the variety at local and national level. Past chairman of the Canary Council and current chairman of the Lancashire Canary Club and few local clubs and regular exhibitor at the World Show where he achieved Gold medal wins in the past. Founder member of the Blue Lizard Canary Club and Secretary of the Lizard Canary Association. An active fancier in prompting the Lizard breed and regular contributor to Cage & Aviary Birds with articles about the Lizard Canary. A tireless worker for the National Exhibition in promoting the Lizard Canary. Past Secretary of the Scottish Lizard Canary Association and Chairman of the Scots Fancy Specialist Club and regular exhibitor in both Scotland and the North East. Kept and exhibited Foreign Birds for 56 years and very successful at both the British & Scottish Nationals and with his knowledge on Softbills and Nectar Feeders (especially Hummingbirds) was able to find ways to establish birds which were previously impossible to keep. Regular contributor to Cage & Aviary Birds. For his long services and contribution to Hetton and Houghton CBS for the past 45 years holding many offices within the society. 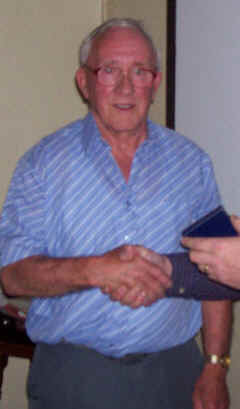 Dennis Norton receiving his NCA Life Vice President badge at the 2007 AGM.